If—as many environmental experts maintain—global climate change is the greatest challenge of our times, the need for a serious, and universal, commitment to low-carbon development is more urgent than ever. Low-carbon development might be described as climate-friendly growth that enables humanity to flourish fairly and equitably within the ecological limits of our planet, and, perhaps unsurprisingly, scholarly work on the topic is booming in research centres around the world. Now, this new Routledge collection enables users to make sense of the most important academic thinking to date. With comprehensive introductions to each volume, newly written by the editors, which place the collected material in the context of current research and practice, Low-Carbon Development is an essential work of reference and a vital research tool for scholars, researchers, students, practitioners, and policy-makers. Part 1: What is Low Carbon Development? 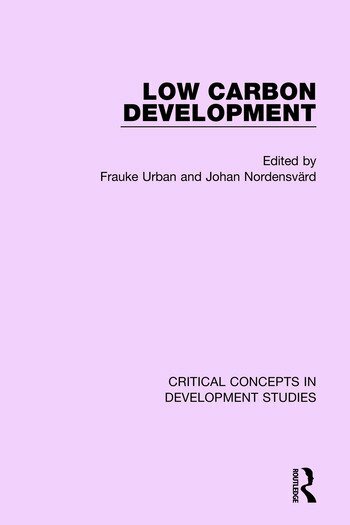 F. Urban and J. Nordensvärd, ‘Low Carbon Development: Origins, Concepts and Key Issues’, in Frauke Urban and Johan Nordensvärd, eds, Low Carbon Development: Key Issues (Routledge, Abingdon: 2013), pp. 3-22. Y. Mulugetta and F. Urban, ‘Deliberating on Low Carbon Development’, Energy Policy, 2010, 38, 12, 7546-7549. J. Skea, and S. Nishioka, ‘Policies and Practices for a Low-Carbon Society’, Climate Policy, 2008, 8, 5–16. J. Urry, ‘A Low Carbon Economy and Society’, Philosophical Transactions of the Royal Society A, 2013, 371, 1-12. D. Messner, J. Schellnhuber, S. Rahmstorf, D. Klingenfeld, ’The Budget Approach: A Framework for a Global Transformation Toward a Low-Carbon Economy’, Journal of Renewable and Sustainable Energy, 2010, 2, 031003-14. Part 2: Why Do We Need It? M. Grubb, ‘Who's Afraid of Atmospheric Stabilisation? Making the Link between Energy Resources and Climate Change’, Energy Policy, 2001, 29, 11, 837-845. S. Sorrell, J. Speirs, R. Bentley, A. Brandt, R. Miller, ‘Global Oil Depletion: A Review of the Evidence’, Energy Policy, 2010, 38, 9, 5290-5295. G. Unruh, ‘Escaping Carbon Lock-in’, Energy Policy, 2002, 30, 317 – 325. A. D. Sagar, ‘Alleviating Energy Poverty for the World's Poor’, Energy Policy, 2005, 33, 11, 1367-1372. R. J. T. Klein, E. L. F. Schipper, S. Dessai, ‘Integrating Mitigation and Adaptation into Climate and Development Policy: Three Research Questions’, Environmental Science & Policy, 2005, 8, 6, 579-588. N. Stern and J. Rydge, ‘The New Energy-Industrial Revolution and an International Agreement on Climate Change’, Economics of Energy and Environmental Policy, 2012, 1, 1-19. M. G. J. Den Elzen, A. Hof, M. Roelfsema, ‘The Emissions Gap between the Copenhagen Pledges and the 2 C Climate Goal: Options for Closing and Risks that Could Widen the Gap’, Global Environmental Change, 2011, 21, 2, 733 – 743. S. Chakravarty, A. Chikkatur, H. de Coninck, S. Pacala, R. Socolow and M. Tavoni ‘Sharing Global CO2 Emissions Reductions among One Billion High Emitters’, Proceedings of the National Academy of Sciences, 2009, 106, 29, 11884–8. M. Jakob, and J. C. Steckel, ‘How Climate Change Mitigation could Harm Development in Poor Countries’, WIREs Clim Change, 2013. A. Grübler and N. Nakićenović, ‘Decarbonizing the Global Energy System: Technological Forecasting and Social Change, 1996, 53, 1, 97-110. R. E. H. Sims, H. H Rogner, K. Gregory, ‘Carbon Emission and Mitigation Cost Comparisons between Fossil Fuel, Nuclear and Renewable Energy Resources for Electricity Generation’, Energy Policy, 2003, 31, 13, 1315–1326. N. Strachan and H. Dowlatabadi, ‘Distributed Generation and Distribution Utilities’, Energy Policy, 2002, 30 8, 649-661. M. Z. Jacobson and M. A. Delucchi, ‘Providing all Global Energy with Wind, Water, and Solar Power, Part I: Technologies, Energy Resources, Quantities and Areas of Infrastructure, and Materials’, Energy Policy, 2011, 39, 3, 1154-1169. S. C. Bhattacharyya, ‘Renewable Energies and the Poor: Niche or Nexus?’, Energy Policy, 2006, 34, 6, 659-663. K. H. Solangi, M. R. Islam, R. Saidur, N. A. Rahim, H. Fayaz, ‘A Review on Global Solar Energy Policy’, Renewable and Sustainable Energy Reviews, 2011, 15, 4, 2149-2163. C. Zheng and D. M. Kammen, ‘An Innovation-Focused Roadmap for a Sustainable Global Photovoltaic Industry’, Energy Policy, 2014, 67, 159–169. M. Hoogwijk, B. De Vries, W. Turkenberg, ‘Assessment of the Global and Regional Geographical, Technical and Economic Potential of Onshore Wind Energy’, Energy Economics, 2004, 26, 5, 889–919. J. I. Lewis and R. H. Wiser, ‘Fostering a Renewable Energy Technology Industry: An International Comparison of Wind Industry Policy Support Mechanisms’, Energy Policy, 2007, 35, 3, 1844-1857. O. Paish, ‘Small Hydro Power: Technology and Current Status’, Renewable and Sustainable Energy Reviews, 2002, 6, 6, 537–556. P. Havlík, W. A. Schneider, E. Schmid, H. Böttcher, S. Fritz, R. Skalský, K. Aoki, S. De Cara, G. Kindermann, F. Kraxner, S. Leduc, I. McCallum, A. Mosnier, T. Sauer, M. Obersteiner, ‘Global Land-Use Implications of First and Second Generation Biofuel Targets, Energy Policy, 2011, 39, 10, 5690-5702. J. Fargione, J. Hill, D. Tilman, S. Polasky, P. Hawthorne, ‘Land Clearing and the Biofuel Carbon Debt’, Science, 2008, 319, 5867, 1235-1238. A. B. Jaffe and R. N. Stavins, ‘The Energy-Efficiency Gap. What Does it Mean?’, Energy Policy, 1994, 22, 804-810. D. I. Stern, ‘Modeling International Trends in Energy Efficiency’, Energy Economics, 2012, 34, 6, 2200-2208. L. Chapman, ‘Transport and Climate Change: A Review’, Journal of Transport Geography, 2007, 15, 354-367. G. J. Offer, D. Howey, M. Contestabile, R. Clague, N. P. Brandon, ‘Comparative Analysis of Battery Electric, Hydrogen Fuel Cell and Hybrid Vehicles in a Future Sustainable Road Transport System’, Energy Policy, 2010, 38, 1, 24-29. F. Geels, ‘A Socio-Technical Analysis of Low-Carbon Transitions: Introducing the Multi-Level Perspective into Transport Studies’, Journal of Transport Geography, 2012, 24, 9, 471–482. P. Smith, D. Martino, Z. Cai, D. Gwary, H. Janzen, P. Kumar, B. McCarl, S. Ogle, F. O’Mara, C. Rice, B. Scholes, O. Sirotenko, M. Howden, T. McAllister, G. Pan, V. Romanenkov, U. Schneider, S. Towprayoon, M. Wattenbach and J. Smith, Greenhouse Gas Mitigation in Agriculture, Phil. Trans. R. Soc. B, 2008, 363, 789–813. T. Garnett, ‘Where are the Best Opportunities for Reducing Greenhouse Gas Emissions in the Food System (Including the Food Chain)?’, Food Policy, 2011, 36, 23-32. G. R. Van der Werf, D. C. Morton, R. S. DeFries, J. G. J. Olivier, P. S. Kasibhatla, R. B. Jackson, G. J. Collatz, J. T. Randerson, ‘CO2 Emissions from Forest Loss’, Nature Geosciences Volume, 2009, 2, 737–738. B. Blom, T. Sunderland, D. Murdiyarso, ‘Getting REDD to Work Locally: Lessons Learned from Integrated Conservation and Development Projects’, Environmental Science & Policy, 2010, 13, 2, 164–172. E. Boyd, M. Gutierrez and M. Chang, ‘Small-Scale Forest Carbon Projects: Adapting CDM to Low-Income Communities’, Global Environmental Change, 2007, 17, 250–259. E. Worrell, L. Bernstein, J. Roy, L. Price, J. Harnisch, ‘Industrial Energy Efficiency and Climate Change Mitigation’, Energy Efficiency, 2009, 2,109-123. S. K. Gallagher, ‘Limits to Leapfrogging in Energy Technologies? Evidence from the Chinese Automobile Industry, Energy Policy, 2006, 34, 4, 383-394. B. Sovacool and M. A. Brown, ‘Twelve Metropolitan Carbon Footprints: A Preliminary Comparative Global Assessment’, Energy Policy, 2010, 38, 9, 4856-4869. S. Nader, ‘Paths to a Low-Carbon Economy—The Masdar Example’, Energy Procedia, 2009, 1, 1, 3951-3958. H. Bulkeley, V. Castan Broto and G. Edwards, ‘Bringing Climate Change to the City: towards Low Carbon Urbanism?’, Local Environment, 2012, 17, 545-551. A. Haines, ‘Health Benefits of a Low Carbon Economy’, Public Health, 2012, 126, 1, 33-39. S. Rao, S. Pachauri, F. Dentener, P. Kinney, Z. Klimont, K. Riahi, W. Schoepp, ‘Better Air for Better Health: Forging Synergies in Policies for Energy Access, Climate Change and Air Pollution, Global Environmental Change, 2013, 23, 5, 1122-1130. A. Haines, A. J. McMichael, K. R. Smith, I. Roberts, J. Woodcock, A. Markandya, and P. Wilkinson, ‘Public Health Benefits of Strategies to Reduce Greenhouse-Gas Emissions: Overview and Implications for Policy Makers’, The Lancet, 2010, 374, 9707, 2104-2114. Y. Mulugetta, T. Jackson and D. Van der Horst, ‘Carbon Reduction at Community scale’, Energy Policy, 38, 2010, 12, 7541-7545. L. Middlemiss and B. D. Parrish, ‘Building Capacity for Low-Carbon Communities: The Role of Grassroots Initiatives’, Energy Policy, 2010, 38, 12, 7559–7566. O. Davidson, K. Halsnæs, S. Huq, M. Kok, B. Metz, Y. Sokona, J. Verhagen, ‘The Development and Climate Nexus: The Case of Sub-Saharan Africa, Climate Policy, 2010, 3, S1, S97-S113. R. Jindal, B. Swallow, J. Kerr, ‘Forestry‐Based Carbon Sequestration Projects in Africa: Potential Benefits and Challenges’, Natural Resources Forum, 2008, 32, 2, 116-130. H. Winkler and A. Marquand, ‘Changing Development Paths: From an Energy-Intensive to Low-Carbon Economy in South Africa’, Climate and Development, 2009, 1, 1, 47-65. A. Pegels, ‘Renewable Energy in South Africa: Potentials, Barriers and Options for Support’, Energy Policy, 2014, 38, 9, 4945-4954. Z. X. Zhang, ‘China in the Transition to a Low-Carbon Economy’, Energy Policy, 2010, 38, 11, 6638–6653. N. Zhou, M. D. Levine, L. Price, ‘Overview of Current Energy-Efficiency Policies in China’, Energy Policy, 38, 2010, 11, 439-6452. F. Urban, R. M. J. Benders, H. C. Moll, ‘Renewable and Low-Carbon Energy as Mitigation Options of Climate Change for China’, Climatic Change, 2009, 94, 1-2, 169–188. A. Kumar, K. Kumar, N. Kaushik, S. Sharma, S. Mishra, ‘Renewable Energy in India: Current Status and Future Potentials, Renewable and Sustainable Energy Reviews, 14, 8, 2434-2442. D. P. Edwards, L. P. Koh, W. F. Laurance, ‘Indonesia’s REDD+ Pact: Saving Imperilled Forests or Business as Usual?’, Biological Conservation, 2012, 151, 1, 41-44. B. Elliston, M. Diesendorf, I. F. MacGill, ‘Simulations of Scenarios with 100% Renewable Electricity in the Australian National Electricity Market’, Energy Policy, 2012, 45, 606-613. S. Moloney, R. E. Horne, J. Fien, ‘Transitioning to Low Carbon Communities—From Behaviour Change to Systemic Change: Lessons from Australia’, Energy Policy, 2010, 38, 12, 7614–7623. P. Smith, D. S. Powlson, J. U. Smith, P. Falloon, K. Coleman, ‘Meeting Europe's Climate Change Commitments: Quantitative Estimates of the Potential for Carbon Mitigation by Agriculture, Global Change Biology, 2001, 6, 5, 525-539. H. Lund, B. V. Mathiesen, ‘Energy System Analysis of 100% Renewable Energy Systems—The case of Denmark in Years 2030 and 2050’, Energy, 2009, 34, 5, 524-531. P. Del Río and G. Unruh, ‘Overcoming the Lock-Out of Renewable Energy Technologies in Spain: The Cases of Wind and Solar Electricity’, Renewable and Sustainable Energy Reviews, 2007, 11, 7, 1498-1513. J. Nordensvärd and F. Urban, ‘The Stuttering Energy Transition in Germany: Wind Energy Policy and Feed-In Tariff Lock-In’, Energy Policy, 2015, 82, 7, 156–165. K. Anderson, A. Bows and S. Mander, ‘From Long-Term Targets to Cumulative Emission Pathways: Reframing UK Climate Policy’, Energy Policy, 2008, 36, 10, 3714-3722. A. E. Duchelle, M. Cromberg, M. F. Gebara, R. Guerra, T. Melo, A. Larson, P. Cronkleton, J. Börner, E. Sills, S. Wunder, S. Bauch, P. May, G. Selaya, W. D. Sunderlin, ‘Linking Forest Tenure Reform, Environmental Compliance, and Incentives: Lessons from REDD+ Initiatives in the Brazilian Amazon’, World Development, 2014, 55, 3, 53-67. J. Goldemberg, S. Coelho, P. Nastari, O. Lucon, ‘Ethanol learning curve—the Brazilian experience. Biomass and Bioenergy 26 (2004) 301 – 304. B. Sovacool, ‘Rejecting Renewables: The Socio-Technical Impediments to Renewable Electricity in the United States’, Energy Policy, 2009, 37, 11, 4500-4513. M. M. Betsill, ‘Mitigating Climate Change in US Cities: Opportunities and Obstacles, Local Environment, 2001, 6, 4, 393-406. K. Van Alphen, P. M. Noothout, M. P. Hekkert, W. C. Turkenberg, ‘Evaluating the Development of Carbon Capture and Storage Technologies in the United States’, Renewable and Sustainable Energy Reviews, 2010, 14, 3, 971-986. W. D. Nordhaus, ‘To Slow or Not to Slow: The Economics of The Greenhouse Effect’, The Economic Journal, 1991, 101, 407, 920-937. S. Dietz and N. Stern, ‘Endogenous Growth, Convexity of Damages and Climate Risk: How Nordhaus’ Framework Supports Deep Cuts in Carbon Emissions, Economic Journal, 2015, 125, 583, 574-602, 201595. M. L. Weitzman, ‘A Review of the Stern Review on the Economics of Climate Change’, Journal of Economic Literature, 2007, 45, 3, 703–724. O. Edenhofer, B. Knopf, B. Barker, L. Baumstark, E. Bellevrat, B. Chateau, B. Criqui, M. Isaac, A. Kitous, S. Kypreos, M. Leimbach, K. Lessmann, B. Magné, S. Scrieciu, H. Turton, D. P. van Vuuren, ‘The Economics of Low Stabilization: Model Comparison of Mitigation Strategies and Costs’, The Energy Journal, 2010, 31, Special Issue 1, 11-38. F. Kesicki and P. Ekins, ‘Marginal Abatement Cost Curves: A Call for Caution’, Climate Policy, 12, 2, 2012, 219-236. C. Hepburn, ‘Carbon Trading: A Review of the Kyoto Mechanisms’, Annual Review of Environment and Resources, 2007, 32, 375-393. H. Bachram, ‘Climate Fraud and Carbon Colonialism: The New Trade in Greenhouse Gases’, Capitalism Nature Socialism, 2004, 15, 4, 5–20. M. Lederer, ‘From CDM to REDD – What do We Know for Setting up Effective and Legitimate Carbon Governance?’, Ecological Economics, 2011, 70, 1900-1907. D. Helm, D., ‘Climate-Change Policy: Why has So Little Been Achieved?’, Oxford Review of Economic Policy, 2008, 24, 2, 211-238. P. Newell, I. Bailey, A. Gouldson, ‘Ecological Modernisation and the Governance of Carbon: A Critical Analysis’, Antipode, 2011, 43, 3, 682-703. M. Lockwood, ‘The Political Sustainability of Climate Policy: The Case of the UK Climate Change Act’, Global Environmental Change, 23, 5, 2013, 1339-1348. R. Wüstenhagen, M. Wolsink, M. J. Bürer, ‘Social Acceptance of Renewable Energy Innovation: An Introduction to the Concept’, Energy Policy, 2007, 35, 5, 2683–2691. D. Schlosberg and L. Collins, ‘From Environmental to Climate Justice: Climate Change and the Discourse of Environmental Justice’, Wiley Interdisciplinary Reviews: Climate Change, 2014, 5, 3, 359-374. J. Nordensvärd, ‘Social Policy and Low Carbon Development’, in F. Urban and J. Nordensvärd (eds), Low Carbon Development: Key issues (Routledge, Abingdon: 2013), pp. 66-78. I. Gough, ‘Carbon Mitigation Policies, Distributional Dilemmas and Social Policies’, Journal of Social Policy, 2013, 42, 2, 191-213. S. Jacobsson and A. Johnson, ‘The Diffusion of Renewable Energy Technology: an Analytical Framework and Key Issues for Research’, Energy Policy, 2000, 28, 9, 625-640. A. Dechezleprêtre, M. Glachant, Y. Ménière, ‘The Clean Development Mechanism and the International Diffusion of Technologies: An Empirical Study’, Energy Policy, 2008, 36, 4, 1273-1283. D. G. Ockwell, J. Watson, G. MacKerron, P. Pal and F. Yamin, ‘Key Policy Considerations for Facilitating Low Carbon Technology Transfer to Developing Countries’, Energy Policy, 2008, 36, 11, 4104-4115. F. Urban, Y. Zhou, J. Nordensvärd, A. Narain, ‘Firm-Level Technology Transfer and Technology Cooperation for Wind Energy between Europe, China and India: From North-South to South-North Cooperation?’, Energy for Sustainable Development, 2015, 28, 10, 29–40. S. Fankhauser, A. Bowen, R. Calel, A. Dechezleprêtre, D. Grover, J. Rydge, M. Sato, ‘Who Will Win the Green Race? In Search of Environmental Competitiveness and Innovation’, Global Environmental Change, 2013, 23, 5, 902-913. J. Laukkonen, P. K. Blanco, J. Lenhart, M. Keiner, B. Cavric, C. Kinuthia-Njenga, ‘Combining Climate Change Adaptation and Mitigation Measures at the Local Level, Habitat International, 2009, 33, 287–292. J. Alcamo, P. Mayerhofer, R. Guardans, T. Van Harmelen, J. Van Minnen, J. Onigkeit, M. Posch, B. De Vries, ‘An Integrated Assessment of Regional Air Pollution and Climate Change in Europe: Findings of the AIR-CLIM Project, Environmental Science & Policy, 2002, 5, 4, 257-272.